INSPIRED by the streets of New York, Gold Coast property developer Howard Group has officially started construction on the Brooklyn Apartments in Varsity Lakes - a six-storey residential tower blending the Big Apple's symbolic warehouse apartment-style living with modern urban design. Taking its name and inspiration from the most populous of New York City's five boroughs, the $25 million project sits on 3000sqm and comprises one and two-bedroom apartments and large open-plan three-bedroom penthouses split over two levels. 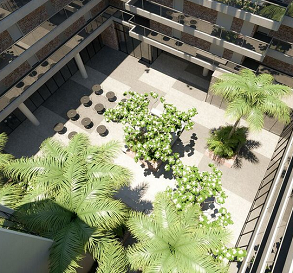 The joint venture with Alceon also boasts a podium urban garden on the first floor with a six-storey atrium green wall and a quintessential "New York" rooftop terrace with barbecues, spas and seating. Mark Howard, of Howard Group, says the Brooklyn apartments bring a high level of "funky" to the area and says the unique architectural design, location and low entry point (starting at $319,000) make it a desirable investment choice for people who work, live or play in Varsity. "We were really looking for something different and something that appealed to a younger demographic that you find at Bond University and in Varsity Lakes," says Howard, a former V8 Supercar driver. In the first two nights of launching, the development received more than 25 expressions of interest. "As everyone knows, development land on the Gold Coast is scarce and Varsity has had no supply for a long time; I saw a lack of both product and land and wanted to think of something groovy," says Howard. "Everyone is looking for something a little bit different - when you are in the Brooklyn Apartments, it is a great and different atmosphere." All apartments feature designer galley kitchens and finishes are offset by high concrete ceilings, exposed feature brick walls, balconies, landscaped communal spaces and skyline views. The project will also feature office studios, eateries and retail spaces. Howard says the Gold Coast property market is strengthening. "I think the Gold Coast at the moment might be heading into its better days," he says. "We probably suffered in the GFC a little more than other places, the other capital cities have had a good lift and I think with a new range of towers and the Commonwealth Games and a few other things, the city is growing up. "The Gold Coast is coming off the bottom we are getting our mojo back." Brooklyn is the first Alceon/Howard Group joint venture in Queensland with the first apartments ready to occupy mid-2016. Other Howard Group developments include Vogue on Broadbeach, The Pinnacle, Sphere Southport and Raffles on Capri.